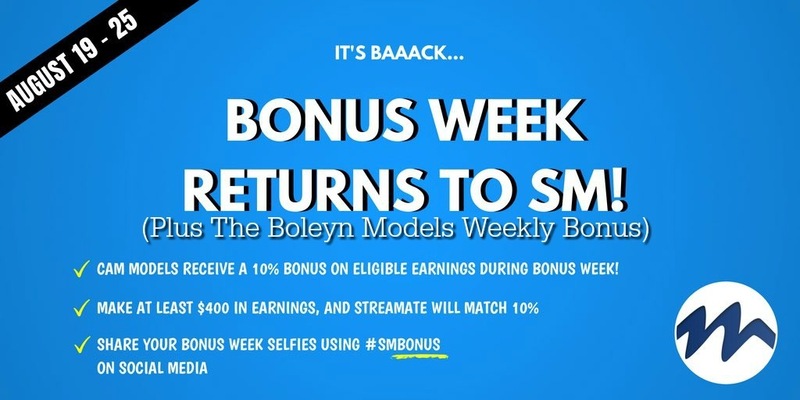 But this week..starting today in fact, will be extra special because SM has created their very own cammodel appreciation week by offering a higher payout percentage. The August Bonus Earnings Week from Aug 19-25th For Cammodels Starts Today! What: #SMBONUS weeklong event! Streamate Models receive a 10% match on all eligible earnings during Streamate Bonus Week ($400 minimum). ‘We’re inviting you to join us for a 10% bonus earnings week from August 19-25th (GMT)! To qualify for the 10% bonus, you’ll need to make at least $400 in eligible earnings during the week. Once you meet that goal, we’ll apply a 10% bonus to ALL of your eligible earnings from the whole week! (Eligible earnings excludes Video Sales, Cammodels, TopSpot adjustments, Partner Site, and Gold Club earnings, which do not count towards your bonus total).